Over the past decade, one of the ongoing hot topics in the world of commercial roofing is green or vegetated roofing. An entire business subset within the world of commercial roofing has sprung up. There are websites and trade shows devoted either entirely or primarily to the subject; and dozens of entrepreneurial enterprises have emerged hoping to find their place in this business. In addition to new entrepreneurs, most of the established commercial roofing manufacturers have created green product offerings. So where did all this come from and what’s all the fuss about? Evidence of sod roofs goes back centuries, initially thought to originate in Iceland. But it has only been in the past 30 – 40 years, starting in Germany, that vegetated roof assemblies have been systematically studied and tested. There are unquestioned ecological, psychological and aesthetic advantages to green roof assemblies. Evaluating the economic picture is not so straightforward. Ecologically, one of the most significant benefits of a green roof is storm water management, especially in urban environments. Many cities have storm water systems that are prone to flooding and back-up during heavy rain events. A green roof can significantly absorb and/or retard the rain water from contributing to the flow in the storm sewer system. Much of the rain water falling on a green roof is eventually returned to the atmosphere through evaporation and transpiration. It is also generally recognized that the vegetation/soil components of a green roof will capture a variety of components commonly found in rain water such as heavy metal ions and nitrogen. Further, as green roof coverage increases in any given locality, erosion caused by storm events will lessen, and the demands on the infrastructure needed for storm water management will be mitigated. Other ecological benefits include cooler air temperatures on a localized microclimate scale, providing a wildlife-friendly habitat, and a roof surface that can capture and hold wind-blown dirt and dust. The psychological and aesthetic advantages of green roofs are closely intertwined. It has long been recognized that people react positively to natural surroundings. Replacing flat, featureless roof surfaces with vegetation is an enhancement to overall quality of life. Aesthetically, the design possibilities that are possible with vegetation are vast. Shapes, colors, and patterns can be managed with plant selection and arrangement. The addition of walkways and seating areas can create a park-like setting. Even the most basic green roof vegetation offers color and texture that would otherwise be absent. The economic benefits of a green roof are realized throughout the life of the roof. The soil cover, plants and natural evaporation/expiration all serve to make the building cooler in summer and warmer in winter, thus reducing overall energy costs. Additionally, because the soil/vegetation layer is protecting the waterproofing layer from ultraviolet light and mitigating temperature cycling, two of the major factors that cause weathering of the waterproofing membrane have been mitigated. 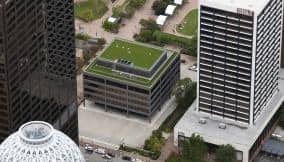 For new developments, it is possible that the addition of green roofs will reduce storm water-related restrictions on impervious coverings. And because of the overall ecological benefits discussed above, there may be financial incentives from municipalities. With the current emphasis on energy and sustainability, the roofing industry has continued to design innovative systems to provide excellent protection for today’s buildings. As a roofing material, asphalt meets these new demands while still delivering on its traditional strengths of high-quality, long-life cycle and reliability. Asphalt built-up roofing (BUR) and modified bitumen roofing systems play a central role in the development and operation of institutional and commercial facilities looking to go “green.” Increasingly, these systems are getting more attention for the benefits they offer these facilities looking to expand their sustainability efforts because multi-ply membranes create a more rigid and stable surface, making the roofing system a better platform for a building’s mechanical, solar panel and vegetative roof systems. Waterproofing – It really does not matter if you have the most-lovely green roof in town if you have leaks into your building. There are numerous manufacturers to choose from, most of which will have a dedicated green roof product line. Note: If your building does not have a green roof, this would simply be referred to as ‘roofing,’ but under a vegetated assembly it is referred to as ‘waterproofing.’ Do not let the differing terminology confuse you. Root Barrier – All green roof systems need to be able to prevent root growth from penetrating the waterproofing layer. Insulation – This component is not always mandatory. The decision to include it will depend on your climate, local codes and other considerations. If the insulation layer is to be placed above the waterproofing, a closed cell type of insulation such as extruded polystyrene or cellular glass is necessary. Drainage Layer/Filter Fabric – These are two separate functional components that are often combined in a single product. The drainage layer allows for lateral water movement and the filter fabric prevents the fine mineral matter in the soil from flushing through and clogging the drains. Growth Media – This is not just ‘dirt’ or top soil. Lots of thought and science go into designing the growth media for a green roof. Soil media ingredients are selected to provide the best performance when considering density, permeability, water retention and erosion. Plants – There are various choices. A critical factor in the plant choice is your local environment and what plants will or will not thrive in that environment. Most green roofs are designed for low maintenance and drought resistance. The class of plants known as ‘sedums’ are the most commonly selected to meet those needs. Irrigation – A thriving green roof is a balance between enough water, but not too much to create problems such as root rot. Most drainage layers allow for water in excess to drain, but will also have a geometry that creates small reservoirs to help with dry periods. Regardless, consideration should be given to either manually or automatically irrigating the roof during extended dry periods. The information presented here is meant to provide base-line knowledge of green roofs. For more information about green roofs and asphalt roofing, visit www.asphaltroofing.org.